Not many people know that biggest source of heat loss in a home are doors and windows. If you are to take up a home improvement project, energy efficient windows are a great idea. However, even the most expensive windows are no good without proper window sealing and installation. When you notice a draft coming from the windows, or rainwater entering the window sill, it is time to take steps to seal the window. If you don’t take action immediately, it could damage the interiors of your home. In most cases, all you need to seal a window is to install weather stripping. 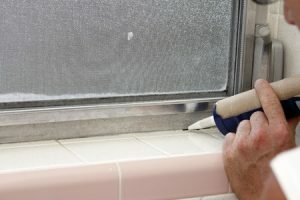 This is one of the cheapest and easiest ways to seal the windows of your house. It is an effective barrier to keep unwanted insects and elements from entering your home. You can install weather-stripping with self-stick foam or in traditional strips. If you are looking for a more involved window sealing, you can opt for window flashing. This is the name given to a process that makes crack or seams weatherproof. In other words, the basic weather stripping is the simple version of window flashing. You can create a simple window seal using tape and caulking. However, if you are looking for an advanced sealing system, you will need specialized foam. You can also choose hurricane windows to make your house safe even with the rough climates. If you know your window requires sealing and you have an older window that needs replacement, you should take steps to get your window replaced with impact resistant windows. Obviously, the window-sealing problem you are facing will get solved when you install new windows. Most homeowners realize that when they seal the window, the leak or draft is eliminated, but the areas are not warm as it should be. At times, getting the windows sealed may not solve the problem of high utility bills. If you have a single glazed window, they will not perform well even when to sealing them. When you use double glazed windows, it improves the energy efficiency of your home and prevents noise from entering your home. Even if you use double-glazed windows in your home, you will have to re-seal them after a few years. However, if you believe that window seal problem is because of an old installation, you must think about upgrading your residential window to reliable storm windows. Try getting quotes from a few window sealing and replacement companies, to find out how much you have to spend on solving the problem. Depending on the size of your replacement windows sealing project, you will need the services of an impact windows installer or any repair person. If you are just looking for basic window replacement sealing, you can get a local repair person who is capable of window flashing or weather stripping. The local installer is usually cheaper when compared to a professional who specializes in window installation. Ideally, you should hire a local professional for your small home improvements. They will usually take care of multiple repair projects during the same visit. This will save labor costs and reduce the overall investment in a home improvement project. Local professional may be good for small projects, but for window replacements and other big projects, it is in your interest to hire a specialized window installer. These specialized professionals have several years of experience in the field, and they will ensure that your household will not face any problem in the future.